Product information "HI981034 Milk pH Tester"
Designed to bring simplicity to pH testing during milk processing, the HI981034 Milk pH Tester is engineered to withstand the tough environment of milk processing plants. 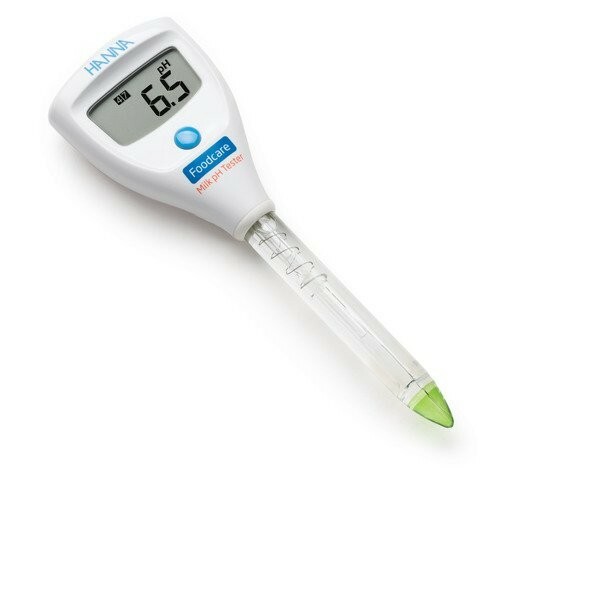 The built-in probe features an open junction, conical glass tip, and glass body making it ideal for measuring the pH of milk during processing. Specialized electrode for pH spot checking during milk processing. The compact size makes the Milk pH Tester ideal for on-the-go testing. A large LCD display provides at-a-glance readings from any angle and single button operation streamlines the testing process for any user. The included CR2032 Li-ion battery provides up to 1000 hours of continuous use. The battery icon will blink to let you know it is time to change the battery so you never miss a measurement. Your measurements require detailed attention; so should your electrode. The HI981034 Milk pH Tester features a built-in probe that has been carefully designed to measure the pH of milk during processing. The open junction design reduces clogging from suspended solids and proteins found in milk during processing for a more stable pH measurement and reduced maintenance. The conical shaped tip design allows for penetration into solids, semi solids, and emulsions for the direct measurement of pH in a variety of milk based products used during the cheese making process. A glass body is easy to clean, is chemically resistant, and quick to reach thermal equilibrium for a faster, more stable measurement. We believe that buying a tester should be simple. Your Milk pH Tester is equipped with everything you need for successful testing right out of the box. Your Milk pH Tester comes with cleaning solution that has been engineered to keep your electrode free from protein and sugar build up. This concentrated combination of detergents cleans your tester quickly and effectively so that your tester stays in optimum condition. When performing a pH calibration it is important that the correct buffers are used. We include some start buffers to get you going. The single-use sachets are indivudally sealed so you use fresh buffer each time you calibrate. Related links to "HI981034 Milk pH Tester"
Customer evaluation for "HI981034 Milk pH Tester"